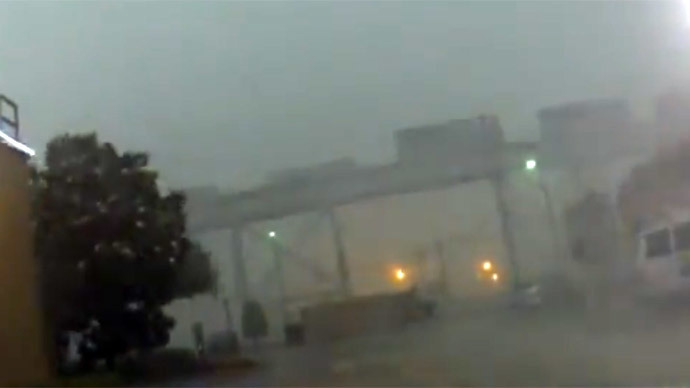 Severe storms in southern Louisiana have blown a train off a bridge in New Orleans. Tens of thousands are without power in the area, while thousands of travelers are stranded at the Louis Armstrong airport. A train belonging to the Union Pacific Railroad toppled off the Huey P. Long Bridge, south of New Orleans on Monday. Weather reports in the area indicated heavy rain and wind gusts of over 70 mph, with tornado warning conditions. According to the local TV station WGNO, which captured the crash on camera, “at least 11 cars” were swept off the bridge. Jefferson Parish Councilman Chris Roberts said the cleanup would take several days, as recovering the cars would require a heavy crane. Photos from the scene showed smashed-up freight cars. The bridge does not appear to have been damaged. The storm that hit southern Louisiana Monday morning left 168,000 residents without power, mostly in the New Orleans and Baton Rouge areas. Power outages also affected the Louis Armstrong International Airport, stranding thousands of travelers in town for the New Orleans Jazz & Heritage Festival. Power was off in the main terminal, with the airfield operating on emergency power, an airport spokeswoman told the Times-Picayune. Entergy Corp. repair crews were reporedly working to restore service.